In this episode, we’ve finally managed to get hold of Ardith Carlton! Ardith’s contributions to the early days of American anime fandom are significant, but “The Legend of Success Ardith” is one of hard work and guts in the face of seemingly insurmountable obstacles. These days Ardith lives in Japan, so if that’s your dream then listen on to find out what it takes! 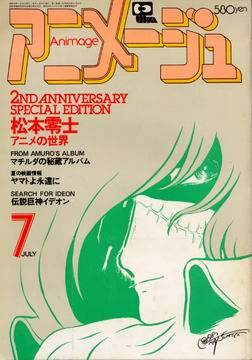 59:50 – Ardith’s involvement with Space Fanzine Yamato, the first American fanzine created that was devoted to one single anime title. You can reference Steve Harrison’s account over at Let’s Anime. An archive scan of the fanzine itself is presumably somewhere on Cosmo DNA, but I can’t find it. That Spring 1980 issue of Fanfare was also scanned somewhere, and now I can’t find THAT either. 1:01:35 – Coming up with THE SECRET LYRICS~! to Galaxy Cyclone Braiger! In 2015, context for the Ugly Robot Anthem is just one click away. If you’re feeling the sting of that shocking finale and need to hear more Ardith Carlton RIGHT NOW, Ardith Carlton: An Awesome Life is a four-part interview with Ardith conducted by Tim Eldred at Anime Weekend Atlanta 2014. Sound off in the comments if you’d like us to have her on again! Pretty amazing interview, so good to hear Ardith once more. I do have to offer one correction for the historical record on our meeting. Marg Baskin and crew didn’t bring a VCR with them to the con. There was concern that there would be a problem at Customs. Ardith had brought some VHS tapes she had borrowed from C/FO Detroit, the main one I recall was the Ziv Captain Harlock tape (oh, that giant ‘rental store’ box! ), I can’t remember the other tape, I want to say it was a Force Five Getta Robo tape but I don’t remember if FHE was releasing that in 1980-ish. Anyway, Ardith brought the tape, the Baskin Gang was burning to see it (as they were all about the Harlock), there was unhappiness, then I butted in and mentioned that I had lugged my 42 pound giant silver VCR all the way from the other side of the state for JUST THIS SORT OF EMERGENCY! We watched that thing twice. Nobody said a WORD. Just all of us hunched around the crappy hotel TV (which, I must say, took my MAD SKILLZ to hack so we could get a signal) watching Captain Harlock fight the evil Zetons. And I wanted a copy of that tape REAL BAD. And nobody I knew, NOBODY else had a VCR. Luckily somebody knew, maybe it was Marg, maybe it was some of my Detroit area contacts, somebody was doing the tape cloning thing. They were being really, really on the down-low about it. Real ‘speakeasy’ stuff, had to know the password. My password was “I have my own VCR that is a king workhorse you can run 24/7”. Turns out the person was…hmmm…I probably shouldn’t mention his name. And yes, what an IDIOT I was, trusting my beloved $1200 USD VCR to a room with COMPLETE STRANGERS. But we early anime fans did things for each other. A day later I got my machine back, and a 2 hour speed copy of the Harlock Tape. I think I’ve watched that thing hundreds of times and I still believe if the entire series had been dubbed like that first tape it may well have been as popular as Star Blazers. I guess I should never stop listening to AWO, as this is the first I’ve seen or heard Hiramatsu Shinji get name-dropped anywhere. For those interested, en.mangareborn.jp has all of his Black Angels legally in English for purchase. Another thing he worked was Doberman Cop (?) with Buronson, the man who wrote Hokuto no Ken. DC was his first big success. As for Yamazaki Ginjiro, ANN says that was Hiroshi Motomiya, but Hiramatsu Shinji’s earlier art does look quite similar, though. Anyway, I loved this episode. It’s always great when y’all get these folks instrumental in early anime fandom on, and Aridith’s tale was particularly interesting. I hope y’all get her back on later to finish up. Next to the Noboru Ishiguro interview, this is my favorite one by the three of you. Also, as a note of no importance to anyone else but myself, she wasn’t the only one who used an audio recorder back in the day to record Battle of the Planets off of the TV (I still have one of the cassettes). That was a nice interview to listen to. It is fun to listen to the early, early days of the fandom. I was part of the wave in the early 90’s with tape trading, where you would ship VHS EX tapes to an address across the country and they’d come back with complete series on them, plus filler like the first Anime Music Videos I remember watching. We would daisy chain VCRs so you’d have one master linked to a lot of copiers, so those VHSes we got in the mail would quickly be propagated throughout the fandom. What a fun and abruptly ended episode. Wish I was better in school as a kid to do some kind of study abroad stuff. I laughed at the end. I’d LOVE to hear more from her. Hearing about my time watching Star Blazers (she’s my sister’s age; I’m a little younger) and wanting to know more about anime in the 70’s is always a fascination of mine. It’s amazing how determined this woman is to do what she wanted and her drive to get it done one way or the other. I’d love to hear what she is doing now. Interesting to hear she wished she had cable TV when he first found out about these shows. Usually in small town America, people often looked to larger markets outside their own for entertainment, and Toledo was no exception (getting cable TV as early as 1966). I envy those early adopters of cable TV and VCR’s like my family did. The only thing I missed out on though was those cool brokered time-deal stations like the ones out of California or New York that would play anime in the raw. You do not get that in the Great Lakes region. Incidentally, I think the station Ardith watched Kimba on was now WKBD in Detroit (ch. 50), but another station, WGPR (ch. 62, also the first black-owned TV station in the country). 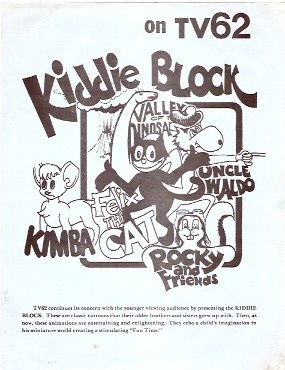 I recall seeing some TV listings in the 70’s that showed they aired Kimba weekdays. I never saw much of 62 at all growing up, though they didn’t have much offerings toon-wise compared to WXON (ch. 20) or WKBD, though they weren’t included on my cable dial otherwise, though these stations could be recieved quite well in Toledo with a decent outdoor antenna. So how long is this cliffhanger going to be? Have cats taken over the internet? What do have they against anisongs? Will Daryl fight back and restore the order? All these questions ..
Just like Tootsie Pops, the world may never know. Ardith’s story was really fascinating and heartening. I feel really glad that she did follow her dream after all that time, and after falling in love with anime almost completely alone. This episode of the podcast was really entertaining, and I’d love to hear more from Ardith!